On a November afternoon, when the light was already revealing the evening intentions and the proximity of a winter that I hope will respect its promises of slowness and coziness, I made a coffee, stole two cookies from the jar and sat in front of my blog. I consider it almost as an independent individual now, endowed with his own will, memories, with plans for the future and sometimes with bad moods or melancholy. Just like me. Tommaso and I just finished our work in the organisation of the food events of Autumnia, something that kept us busy for weeks. I slowed down my cooking classes and closed some pending projects that had been waiting for us after the honeymoon. We’re finally entering into our low season here at Juls’ Kitchen, something I got used to, after the initial panic, something I now need: to reflect, to rest, but also to grow. After so many busy months, feeling slightly nostalgic, I opened the pages of my blog to read old posts, to understand where we are now. The excuse was to collect all the pumpkin and squash recipes to create a round-up of seasonal orange hued dishes, to add new ideas to your weekly meal routine. The true reason, though, was to have a closer look at the blog, turn it in my hands, weigh it, hug it. Juls’ Kitchen is almost 10 years old. Here on the blog you can find almost 700 recipes. The first were just experimentations, identity statements through difference: I would cook recipes that were as far as possible from my everyday life. It was the time of muffins, cupcakes and brownies. Then over time, Tuscan cuisine took over. When I recognised my story in the shared memories of a pappa al pomodoro, when I discovered I had firm roots, which sink into the stony ground of a Tuscan olive grove, I gratefully embraced all those dishes that had contributed to create my gastronomic identity. That was the moment for panzanella and trippa alla fiorentina. Over the years, though, alongside the more traditional dishes and their stories, I started writing about a spontaneous and generous way of cooking, influenced by the passing of seasons and by the common ingredients that can be found in any pantry. Cooking is a pleasure, but also a daily routine that can create a profound bond, a sense of family and memories that will stay with us forever. This is when the idea of ​​a cooking repertoire appeared. My cooking class attendees are the family who helped me develop a reliable repertoire, a mental list of tested Tuscan recipes which tell a lot about who I am and how I like to cook and eat. This is also when I decided to leave aside recipes designed to impress in favour of those handy dishes you could cook on a moment’s notice, recipes that would express my true sensibility as a cook, not my ambition. When you have guests for dinner you can rely on your trustworthy collection and enjoy the evening. Today Juls’ Kitchen is about stories and recipes. The stories are those of the daily life of a thirty-something couple living in a farmhouse in the Tuscan countryside with a huge white dog and a postcard view from the bathroom window. Despite the beauty of the landscape, we shy away from clichés and aspire to reality, to tell you about our real, imperfect, messy life. We face the daily challenges of working together, failing to find a balance in between private life and work. 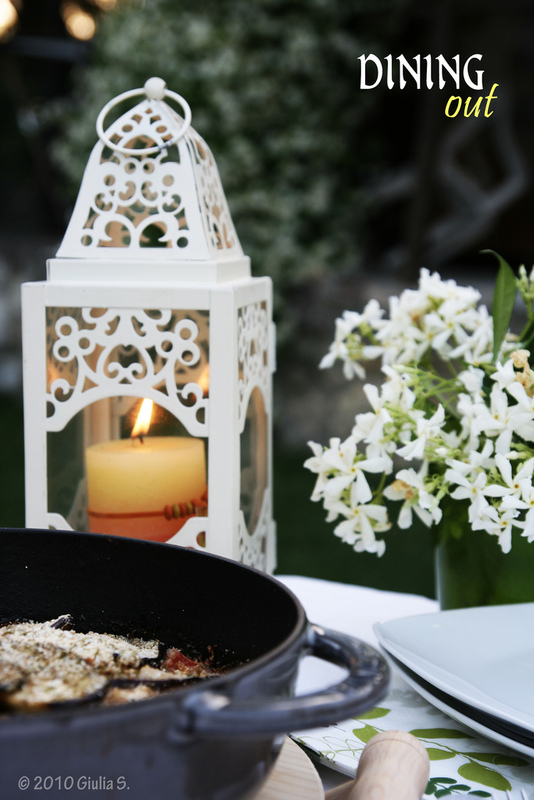 We are committed to creating a sense of family, inventing a new routine of dishes and rituals. We are working on our priorities as a newlywed couple, trying not to get overwhelmed by work and expectations. We believe in the importance of content, and for this reason we will continue to focus on the blog and on the newsletter, more than on Social Media (though we are there too, even if sooner or later we will have to learn how to control the – too much – time we spend there). 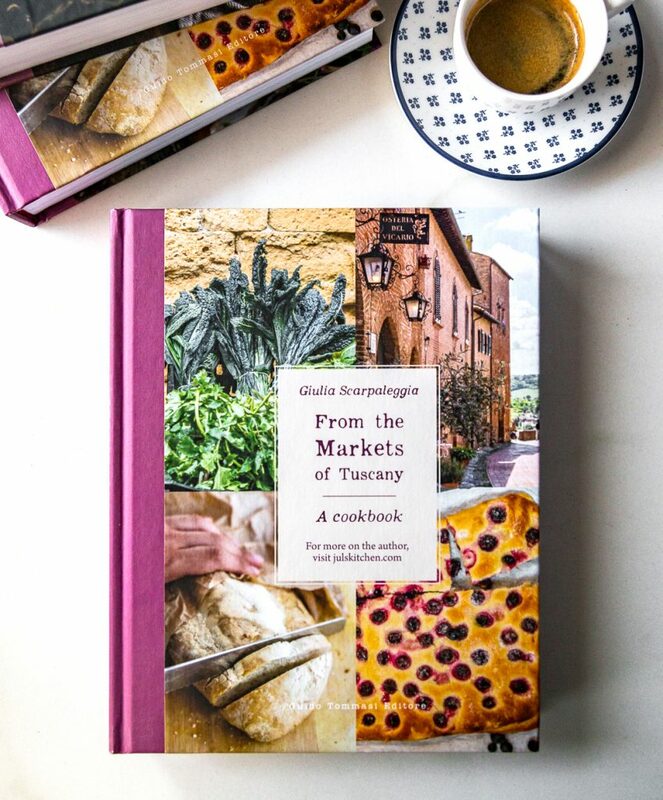 The recipes are those we love to eat, those we teach during cooking classes, those that we put on the table in the evening after a day spent cooking, photographing or writing. And washing sinks full of dishes, too. There are the everyday recipes that save you dinner with a few ingredients, or those reserved for special occasions, when your friends challenge the distance and the country road to visit you. The recipes that save your dinner are brilliant ideas to use common ingredients and turn them into a meal. 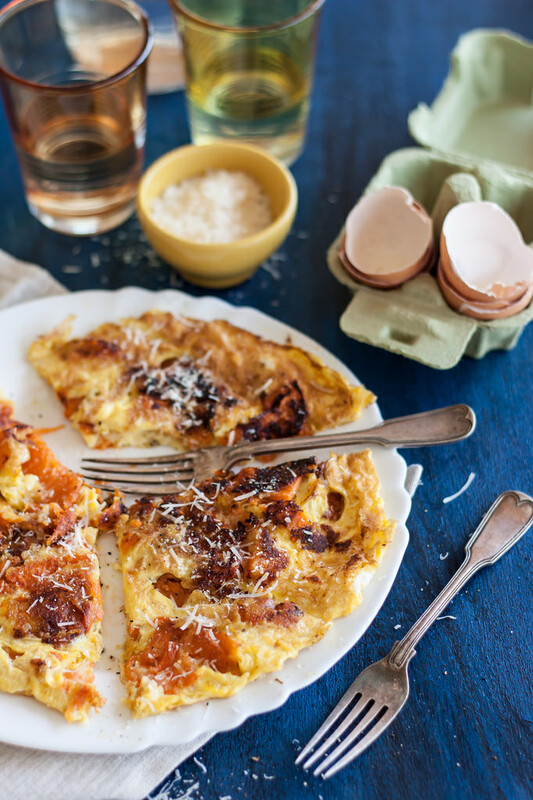 These butternut squash pizzette are a good example. When you have a sudden desire for pizza, one of those burning, insatiable cravings, it is impossible to calm it down with a bowl of spaghetti or a grilled chicken breast. But if you have a few slices of butternut squash, a jar of peeled datterini and some mozzarella, your dinner can instantly improve. It won’t be a pizza, but the taste is so similar that you’ll want to cook these pizzette more often, not just to save your dinner at the very last minute. In summer I would use eggplants, now I slice the top of a butternut squash. You will get round slices: brush them with extra virgin olive oil and sprinkle with salt and pepper, then roast in the oven until slightly caramelised. 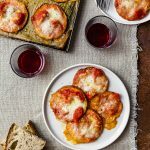 They are a delicious seasonal side dish I like to serve with a roasted pork loin, but add a few tablespoons of tomato purée and a mozzarella torn into pieces and you’ll get in about half an hour tasty pizzette, your dinner. Heat the oven to 200°C (400°F - Gas mark 6). Slice the top of a butternut squash into 12 thin slices (they should be no more than 5 mm thick). Cover a baking sheet with parchment paper. In a cup, beat the extra virgin olive oil with water and salt, then brush with it each slice on both sides. Arrange them onto the baking sheet. Bake for about 12 minutes, until the squash begins to brown. While the squash is cooking, prepare the tomato for your pizzette: in a bowl crush the datterini with your hands. You can also use a tomato pulp, choose one that has some texture, avoid those that are too liquid. Season the tomato with olive oil, salt and dried oregano. Remove the squash from the oven and spoon the tomato over it, then bake again for 5 minutes. While the tomato is cooking, tear the mozzarella into small pieces and mix it with the grated pecorino. Top the tomato with the mozzarella and bake for the last 5 minutes, until the mozzarella has melted. Serve the pizzette immediately, or reheat them just before eating, either in the oven or in a pan. Here we are with the pumpkin and squash recipe round-up which unconsciously set the tone for today’s post: fifteen recipes including home made fresh pasta, soups, risotto, a main course, a side dish, a dessert and even a jam. If I think that I started to appreciate pumpkin thanks to the blog, I am amazed at how, in less than ten years, it has gone from being an unusual ingredient to becoming the symbol of autumn comfort in the kitchen. What would you add to this collection? Is there something you’ve already cooked? A few years ago I found myself with a bowl of cold chickpeas and some butternut squash which screamed to be used as soon as possible. They married in a thick soup tinted in autumnal colours and since then this has been my go to meal when I’m in a hurry and I need a comforting bowl of steaming soup to cheer up my day. Save a few tablespoons of chickpeas to spoon over the soup, they’ll add texture and a nice decorative touch. Serve it with toasted bread smeared in blue cheese and you can call it a meal. This rice timbale with pumpkin and sausage is a Christmassy must – or simply a festive idea. It’s a festive dish, warmed by the orange of the Mantuan pumpkin and the energetic stirring over the heat. It’s a recipe which requires our presence from the beginning to the end, keeping us firmly rooted to the here and now. There’s a video recipe in the post, too. A few years ago, on the way back from London I was reading BBC Good Food on the plane when my eyes fell on a recipe, the butternut squash macaroni cheese. Since that moment I couldn’t wait to get into the kitchen to reinvent a classic dish of the Italian cuisine, la pasta ai quattro formaggi, our national version of the American mac&cheese. I melted in a creamy sauce all the leftover cheese in the fridge, including a precious to me British blue Stilton from Harrods, a small personal gift from the airport duty free! Along with the cheese, I added a fruity Mantua pumpkin, with a thin and soft greenish skin and a not too sweet fragrant flesh. The pici are made with plain wheat flour and a part of wholemeal rye flour, which gives even more texture and flavour to these home made noodles. The dressing is seasonal, my pièce de résistance during autumn cooking courses: butternut squash and leeks cook on low flame doused with extra virgin olive oil until they become a sauce, crumbled fresh sausages add a savory and peppery note and a generous handful of fresh Pecorino Toscano PDO melts in the pan and embraces the pasta. You can prepare these pici with their butternut squash and sausage dressing in about one hour. Have I convinced you to try them? When Tommaso and I started to live together, I would brag with everyone about how I managed to bring this Florentine guy to the countryside. Actually, he is not a pure city guy, his family is from Mugello, a mountainous and hilly area above Florence, and these roots emerge in his food tastes. If I have always had a soft spot for ravioli maremmani with ricotta and spinach, he would rather eat every day, for lunch and dinner, tortelli mugellani, those filled with potatoes and a hint of garlic and parsley. So I made him tortelli, though I tried to sneak some pumpkin in, previously baked with olive oil, salt, pepper and a generous pinch of nutmeg: it is Autumn, I want every dish that I make to reflect the colours and scents of these misty days, lit by the flames of yellow and red leaves of the trees in the wood. At first it seems an unusual and risky pairing. I had the same feeling as I was stirring the risotto in the pot while the clams where opening up in the pan, releasing their salty smell. Instead it turned out to be a winning match. Be generous with clams, they not only will add an unusual purple shade which will create a stunning colour contrast with the orange risotto, but will also soften the sweetness of the butternut squash with their natural saltiness. You can make the risotto just with extra virgin olive oil and garlic, without adding butter or cheese. You will have a light first course which won’t miss a delicate creaminess, as the butternut squash will melt slowly while cooking. Roasted butternut squash with a good drizzle of extra virgin olive oil, sea salt and black pepper is my favourite autumn side dish. You can use leftover roasted butternut squash or even roast a whole tray of squash just for this recipe, saving a few slices for your next meal. 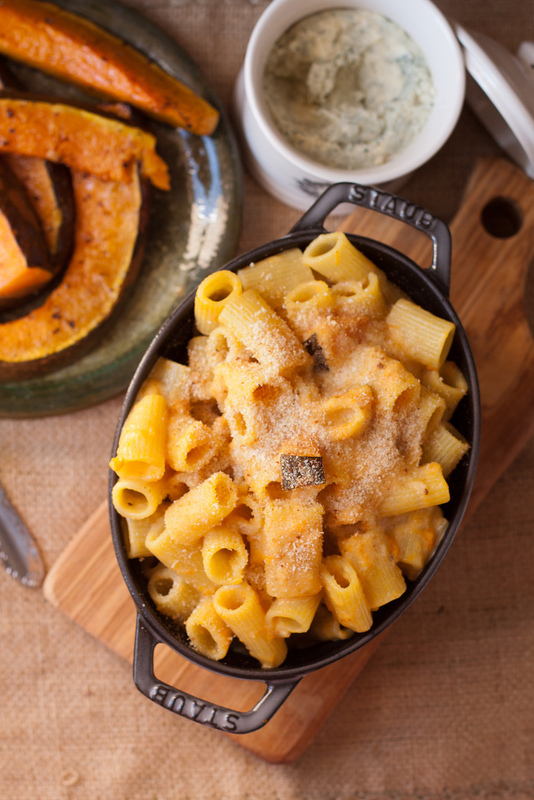 The natural sweetness of butternut squash is perfectly balanced with a handful of grated pecorino. There is a very short time of the year when eggplants, still firm and purple, thrive in the garden and on the market stalls with the orange squashes. They are not only complementary in colour but also, and above all, in flavour. The backbone of this salad is a blend of brown basmati and wild rice, which keeps the chewy al dente texture even after a few hours in the fridge. I added roasted butternut squash and eggplant, then olives, capers and chives. It is an autumn brown rice salad for your lunches in the office and for those evenings where you already know that you will be late and want to prepare something in advance. It suits also the lazy mood of those Autumn night made of couch and TV series, when you just have to choose what to watch, as the salad is already waiting for you. You know that eggplant parmigiana is my favourite dish. If I could, I would it eat it all year round in spite of the season. Well, I found a worthy substitute that does not make me regret the eggplant! The baked squash is quick to prepare and if you brush thin slices with extra virgin olive oil they’ll become crisp, keeping a soft and sweet heart, just like the eggplant slices you would fry at the end of summer. Then you proceed as in the most classic of parmigiana: a good tomato sauce, pieces of mozzarella torn with your hands and heaping tablespoons of parmigiano reggiano. I had been thinking about this salad for a while, my body was demanding vegetables, and colours, and good olive oil. For the first Sunday lunch at home, along to the most classic roasted chicken, I prepared this salad, a warm roasted pumpkin salad with peppery rocket, black olives, shaved parmigiano Reggiano and toasted pine nuts. Everyone had a second helping of this salad, which grabbed the spotlight from my carefully roasted chicken, with the most exquisite crisp golden skin. Serve these meatballs with a nut pesto, where pistachios and pine nuts team up with mint, that is the natural complement to lamb meat. Prepare also a salad of shredded cabbage and season it with extra virgin olive oil, salt, black pepper and a squeeze of orange juice. Better still, add a few wedges of orange directly into your salad. The butternut squash and lamb meatballs have a distinctive flavour, they are moist and sweet, with a warm orange hue. Brighten them up with a spoonful of pesto and a few wedges of orange and serve them as a main or into a soft bun if you have leftovers. This butternut squash cake reminds me the good smell of home, of a welcoming kitchen, of a quiet breakfast at the kitchen table. Since then I baked the cake several times, fascinated by the moist texture given by the butternut squash pureed with yogurt. Just like a carrot cake, it conceals a good deal of vegetables and stays fresh for a few days, making it the perfect breakfast cake. The butternut squash is warmed by a teaspoon of grated nutmeg, a spice that goes perfectly with a cup of milk or black tea. You can find a gluten free version here, too. In this post I was writing: “There will always be a cake, especially after the weekend, and it will stand there in the middle of the table for friends coming in the afternoon, or later, because two slices of cake on a cake stand in the centre of the kitchen table create immediately a feeling of home, and I need this feeling of warmth to accompany me throughout the day. And if you come, be sure you’ll always find also tea or coffee, just ask.” This was dedicated to Tommaso, even before I knew it. And it is not over yet. There are also two older recipes, a pumpkin omelette with a reflection on Halloween and the morte secca and a butternut squash soup with chicken meatballs, with a rather embarrassing photo. Yet I fondly remember everything about that post: writing and photographing it, but mostly the comfort of that soup. Looking at these recipes brings me right back to your lovely kitchen. Our cooking class was truly a highlight of our trip to Italy. We learned a lot and the food we made was delectable! We are excited to try the recipes across the ocean here in New Jersey. Tuscany is like a dream! How can I send you a few pics from our wonderful day? Ciao Phyllis, you make me so so happy! please, send us thew picture, I’d love to see them! you can send me the photos via Dropbox to my email! Warm regards from me and Tommy!